NES Lighting Distributors works with the best lighting manufacturers in the world, ensuring that you have the variety of LED lighting fixtures you’re looking for. Whether you’re looking for LED light fixtures or panels, indoors or out, you’re sure to find something that perfectly fits your space. When you’re in need of commercial LED lighting, nothing beats the selection you’ll get with NES. Here are some of the best deals you can get from our lighting distributing company. The fixture is designed to be used in Stairwells and comes with an integrated occupancy sensor and a bi-level driver. When the stairwell is occupied the fixture is at full brightness. When the space becomes unoccupied, the fixture automatically dims for even more energy savings. Click here for spec sheet. 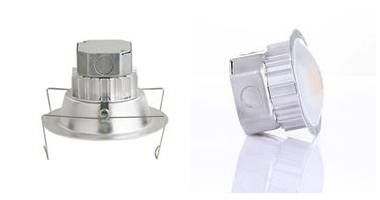 The HBLED is an outstanding value for a wide variety of applications and mounting heights. 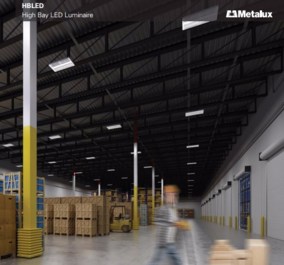 Precision designed optics,multiple distributions, lumen outputs and color temperatures make the energy-efficient HBLED the ideal solution for industrial, commercial, manufacturing, gymnasium and other high bay applications that utilize traditional HD and linear. Click here for brochure. ​This BR30 LED has been designed for demanding commercial applications, hospitality facilities, restaurants, bars, cafes, or wherever you need a warm, dimmable, and shatter resistant LED. Featuring the revolutionary CLOUD design, this 9W lamp weighs just 103 grams and looks like a traditional incandescent. Click here for data sheet.